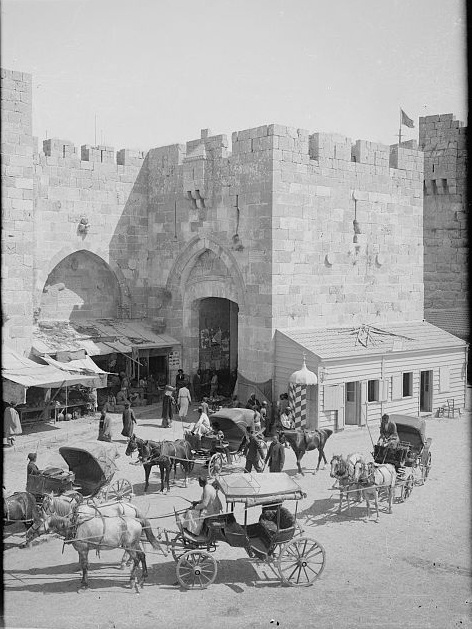 The Library of Congress archives houses 22,000 pictures of Jerusalem and the Holy Land taken by the American Colony photographers between the 1890s and 1946. But, we recently discovered more of the American Colony photographs in the George Eastman House collection. We were particularly impressed with a collection of "transparencies ... with applied color." What we call today "slides" were shown with a lantern. The color was painted in. Why might the picture look strange to viewers of this blog? 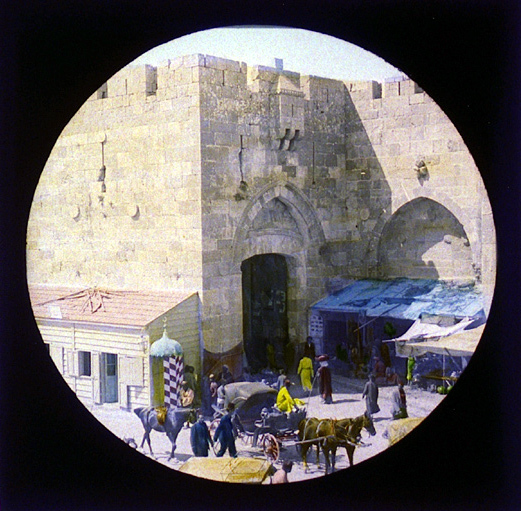 Because we recently published the picture in black-and-white in a feature on Jewish shopkeepers in the Old City, but that picture was not reversed as this color one is. of the Jaffa Gate in 1898 and creation of a road. department in 1898 and he may have taken this picture. signs show hat models and a store name in Hebrew. How was the reversal done? And why? I suspect it was done by the technician or archivist when they were digitalizing the slide.